We are assisted by a crew of experienced personnel who are enormously indulged in bringing forth a broad gamut of Insulated Casserole Set. Our Insulated casseroles are manufactured from highest quality plastic and steel with advanced machinery to keep the finish of end product at its best. 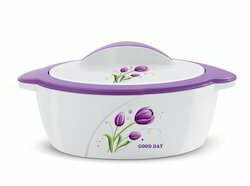 We are one of the leading suppliers for Plastic Insulated casserole. These casserole are made up of outer plastic and inner plastic. The RAW material of plastic used is Pure virgin, High in quality and of food grade. The glossy finish of the product is such that it nourishes the standards of your kitchen. 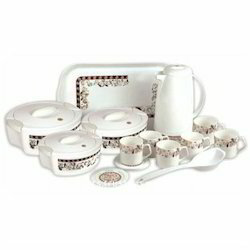 We supply a wide range of Plastic Fancy Casserole which is offered in different sizes and shapes. This is a UPHAR combo set containing a stainless steel insulated casserole SMILEY 2800 and a hot & cold insulated stainless steel jug STYLISH-8. On offer from us is high quality Plastic Insulated Casseroles for our respectable customers. Our products are manufactured using food grade plastic so that it is in adherence with international quality standards. To rule out every possibility of defect, we inspect these casseroles on certain parameters of quality.